Endorsements from Pakistani and Indian community and business leaders in Hicksville, East Meadow, New Hyde Park and Westbury. Democrat George Maragos with members of the Pakistani and Indian community and business leaders from Hicksville, East Meadow, New Hyde Park and Westbury. Photo by: Office of George Maragos. Mineola, NY - April 4, 2017 - George Maragos, candidate for Nassau County Executive, is pleased to announce that he has received the enthusiastic endorsement and growing grassroots support of Indian and Pakistani community and business leaders for the September 12th Democratic primary. 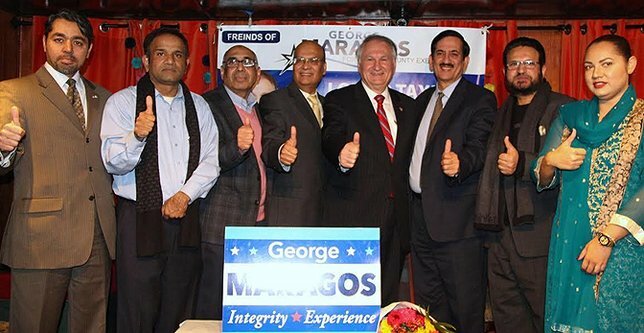 The supporters of the Maragos campaign include Dr. Aslam Baig of East Meadow, Vakil Ansari, Zia R Qureshi, Talib Hussain, and Fazlul Haq Syed of Hicksville, Mr. Shafqat Tanweer and Haron Khawaja of Old Westbury, Mukesh Amin of New Hyde Park, and Saadia Taqi a community activist. “It is an honor to receive the support from so many successful and concerned civic leaders from throughout Nassau County. They understand that hand-picked candidates only serve the special interests and never put the people first. They know that only a County Executive who is not beholden to special interests can root out corruption, lower the unaffordable taxes and create affordable housing” said George Maragos. “George Maragos is a successful business person and the only qualified candidate with proven experience, and unquestionable integrity, who can bring about real change to improve public safety and protect us from the fear of Trump’s immigration policies pervading our communities,” said Talib Hussain a businessman from Hicksville. “Our minority communities account for nearly 40% of the county residents but they are forgotten when it comes to government representation and a voice in policy. We are confident, that as an immigrant himself, Mr. Maragos will give our forgotten communities a voice in government and a seat at the table. Nassau County is our home too.” said Miss Saadia Taqi, a community activist. George Maragos is the current elected Comptroller of Nassau County serving in his second term. He holds an MBA in Finance from Pace University in New York and a Degree in Electrical Engineering from McGill University in Montreal. George has more than 35 years senior management experience in consulting, technology and banking as vice president of two global banks. He established a successful technology company that today is managed by his sons. George is an immigrant from Greece and has shown that with determination and hard work one can achieve a better life for their loved ones. He currently lives in Nassau County along with his wife of 44 years, Angela. Subject: LongIsland.com - Your Name sent you Article details of "Democrat George Maragos Receives More Endorsements for Nassau County Executive"